Aarhus-based artist Lhuma is picking up traction right now. 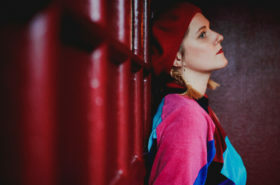 With her brand-new single, “Run”, premiered today on Good Because Danish, she’s gaining more momentum, and we think she gives off a ton of appeal. Now that we reckon 2018 is going to be her most fruitful year so far. A year ago we have written about Lhuma’s debut album “She Knight Rise”, that was released in November 2015. After a long time, she is back with a new craftsmanship. The story is scheduled to be released as an EP later this year, starting with a promoting music video to single “Run”, co-produced by Brian Batz (better known as Sleep Party People) and Aske Bode (Bodebrixen, Waitress). Especially for you, she told us about her music project and the upcoming material in an exclusive interview down here. “”Run” is a song about longing and pain, its a song about running off into the wild sea, washing all that pain and worry out. Swimming in the ice cold waves, disappearing into the dark water. And finding oneself again, somewhere down there, feeling part of something bigger and released from pain – at least for a little while.” – as Lhuma says about her single. 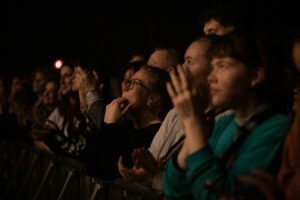 The leading single “Run” is followed by a video presenting a dancer and choreographer Sigrid Norheim Ørntoft, directed by Lhuma itself and made by Swedish photographer Donovan Von Martens. The pictures of a wild sea and nature are captivating from the very first shoot. You can feel the atmosphere coming from the song picked up by waves striking the seashore, sea breeze shaping the dancer’s body and cloudy sky warning about the coming storm. It is an impressive demonstration of Lhuma’s intelligent music followed by rich vocal skills and contemporary sounds owing to the new collaboration. Thus, we perceive an absolutely riveting connection between lyrical part of the song as well as either motion picture or choreography we get. The story behind is about running away from the wrong people, mostly an escape from someone who has hurt us. Someone, whom we allowed to get a bit too close to us and we regret that moment as she signs “I let you fall in deeper, I let you cut me deeper”. The dancer is making it even more convincing. Sigrid Norheim Ørntoft is pretty impressive with her body and face expression as well. The last scene builds upon the highest tones of the final music part when she is running towards the powerful sea, crossing the striking waves is something we won’t forget for a long time. Seeing that it shows a beautiful interpretation of mental rebirth through conquering over the weaknesses. It is one of the best song and music video we have seen this year so far. 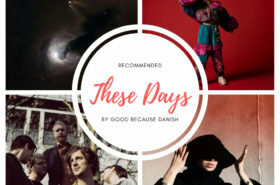 We are truly honoured to reveal this gem on Good because Danish as the first ones. GbD: How did your adventure with music begin? LHUMA: Since I was a child, playing or listening to music has always felt like a portal into some greater inner universe, where everything feels clearer, bigger, sadder, more honest and more beautiful. A universe that just pulls me in with such a power. One of the things I remember very clearly is the first time I deliberately made up lyrics for a melody. I was around seven years old, playing my little Casio keyboard and putting together the words. I recall this wonderful feeling of creating a little piece of magic – all though it was a super simple and silly song – that feeling really rocked my world. Later on, I started to create songs, that felt more like writing my diary, songs that somehow released and expressed all the things happening inside of me. That was the real beginning of my adventure – and making music got me totally addicted. Where did the idea for the name Lhuma come from? I was playing around with elements of my own name, cause Lhuma is a solo project, and I wanted my alias to be a part of my person, but still another version of it – that version of my self who swim away into the music. I turned the first syllables from my name around (Malou); and heard Lhuma. I like Lhuma cause it sounds to me as human and illuminated, and that is a pretty good picture of what I feel like when I’m in the flow of the music. Your new single “Run” was co-produced by Aske Bode and Brian Batz from Sleep Party People. How did you cooperate together? I brought my demo to Aske and Brian in the Batz-studio, and we basically build everything up around that. I very often get pictures in my head when I make a song, and before we started the work, I told Aske and Brian about this girl I pictured, fighting the wild waves. About her being so sad that she just wanted to disappear into the dark water, about nature shaking everything up, changing her feelings into something new – I wanted the music to sound like that! I think it was actually very good to have this storyline to stick to during our work. Aske and Brian were sharing the chair in front of the computer, partly playing and recording new ideas, partly mixing it under the way, switching places all the time, Aske playing synths, Brian grabbing a guitar and so on, while I just listened and commented on their ideas. We did this for two days in a row, and then we all went home to listen. At home, I made up a new chorus and an outro vocal, that I recorded and brought with me a couple of weeks later, along with some sampled sounds of waves. All this was added to the track and we spent a couple of days working on it. We finished the work in Askes studio Pinlig Tavshed, where Bode and Batz mixed it together, and here it was also mastered by Aske. Working with those two guys was really fun and meaningful. Could you tell us something about your upcoming EP? Yes! I’m really looking forward to this EP. Its gonna carries five very different songs, and I have really given these songs a lot of love during the past many months. Aske Bode and I are right now in the process of putting the last details for the live versions together, and we are actually playing all of the new songs live in two days, this Wednesday at a concert near Copenhagen, at a secret venue in Ishøj….so if anyone is curious, they can experience them very soon! Lhuma will be playing a secret concert in the nearby of Copenhagen as a follow up on the release. 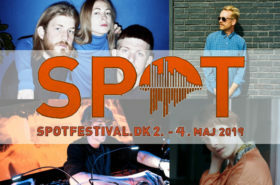 The meeting point is Ishøj Kultur Café, and from there a minivan will take you to the secret venue. It’s gonna be a very special concert, with lights special designed, and a lot of new songs on the program. Do not wait any longer and check out more about the event on Lhuma’s Facebook page.